Successfully Added 17.1 Inch Portable DVD Player - 1366x1280, Region Free, Anti Shock, USB, SD, AV, Game Emulation to your Shopping Cart. Compatible with most DVD and CD discs available on the market you can use EVD, DVD, SVCD, VCD, CD, CD-R/RW with this player and the region free support means there are no restrictions, so you can buy DVDs on holiday or from overseas and enjoy them on this player. You will experience great quality sound from the built in stereo speakers and with FM radio as well as SD card and USB pen support it has plenty of options for great music playback. you can even listen without disturbing those around you thanks to the 3.5mm audio headphone port. Watch movies, listen to music or play games on the go without interruption thanks to the advance anti shock protection ensuring you get a smooth experience no matter how rough your trip. NES game emulation will let you relive the 32 bit classics and is yet another way to keep the kids entertained on those long journeys. stick up on movies and never run short of media as this DVD player is compatible with SD storage cards and memory pens as well letting you take a whole library of entertainment with you when away from home. 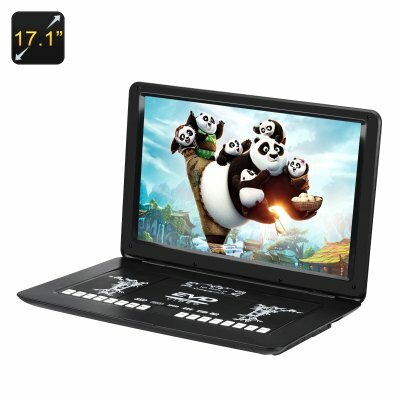 This 17.1 inch wide screen portable DVD player comes with a 12 months warranty, brought to you by the leader in electronic devices as well as wholesale portable DVD players..
Great screen, noisy mechanism. Plays anything. Volume controllable from loud to very loud. Cheep finish. Motor gave up after 6 months.